A CBI court today framed charges against former Telecom Minister A Raja, Rajya Sabha MP Kanimozhi and 15 others in the case relating to the 2G spectrum scam. Special Judge OP Saini framed the charges after all the 17 accused pleaded not guilty and preferred to stand trial in the case. The other accused involved in the 2007-08 scam are former Telecom Secretary Sidharth Behura, Raja’s then personal secretary R S Chandolia, 10 corporate honchos and three telecom companies. 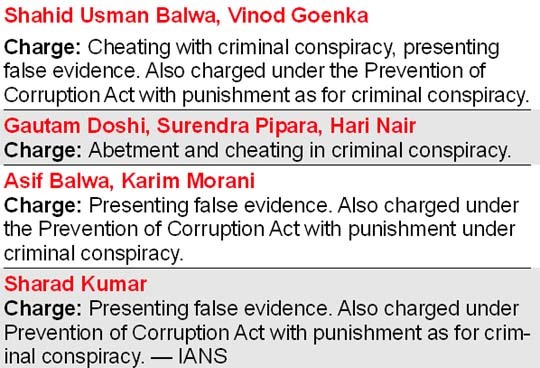 All the 17 accused have been slapped with charges under various provisions of the Prevention of Corruption Act, 1988 and for criminal conspiracy under Section 120-B read with Sections 420 (cheating), 468 (forgery) and 471 (using a forged document). Raja and Behura also will be tried under Section 409 of IPC (criminal breach of trust) which prescribes a minimum sentence of 10 years in prison and a maximum punishment of life imprisonment. The CBI had clamped this charge against them for causing huge loss to the government by allocating the scarce spectrum in 2008 at 2001 prices, instead of auctioning it to realise the prevailing market rate. The other accused will also face the charge under Section 409 of the IPC, but it would not be treated as a substantive offence against them. The Judge ruled that there was prima facie evidence against the accused to conduct a trial under the charges. Now that the charges have been framed by the trial court, all the accused could seek bail afresh. Almost all of them had gone up to the Supreme Court but were denied bail. The bail plea of Kanimozhi, daughter of former Tamil Nadu CM and DMK chief M Karunanidhi, is slated for hearing on October 24. Judge Saini read out the operative portions of the over 500-page order in the packed courtroom in the Patiala House complex. “You accused A. Raja and Sidharth Behura dishonestly, in pursuance to the conspiracy, disposed of/allocated valuable spectrum, over which you were having dominion, which was entrusted to you in the capacity of being public servants,” the order said. The Judge noted that the spectrum was allocated to M/s Swan Telecom (P) Limited and M/s Unitech Wireless (Tamil Nadu) Limited in violation of the law with a view to causing wrongful gain to these companies. Thus, Raja and Behura committed an offence punishable under section 409 read with 120-B, IPC. The probe agency had filed the first chargesheet on April 2 against six of the accused - Raja, Chandolia, Behura, Swan Telecom's Shahid Usman Balwa and Vinod Goenka and Unitech Wireless' Sanjay Chandra. The next chargesheet was against Reliance Group's Gautam Doshi, Surendra Pipara and Hari Nayar, besides three companies, Unitech Wireless, Swan Telecom and Reliance Telecom. The CBI subsequently filed its charges against Kanimozhi, Kalaignar TV's chief Sharad Kumar, Cineyug Film`s Karim Morani and the directors of Kusegaon, Asif Balwa and Rajeev B. Agarwal. Raja had resigned as telecom minister on November 14, 2010 in the wake of the CAG report placing the presumptive loss at a whopping Rs 1.76 lakh crore.